Picking a cell phone company and smartphone plan can get complicated fast. How much data you need, what type of phone you want, how important network quality is to you, and how much you’re willing to spend all shape the decision. On the plus side, the plethora of choices mean you may be able to save quite a bit of money if you’re comfortable with the trade-offs that come with some of the less-expensive smartphone plans. For example, my family switched from a Verizon family plan where we were spending over $70/month per smartphone to a prepaid plan from Straight Talk. We’re now paying $45/month per line for unlimited talk, text, and data. Straight Talk resells service on AT&T’s network, so we still have national coverage when we travel, albeit coverage that’s not quite as comprehensive as Verizon’s. J.D. 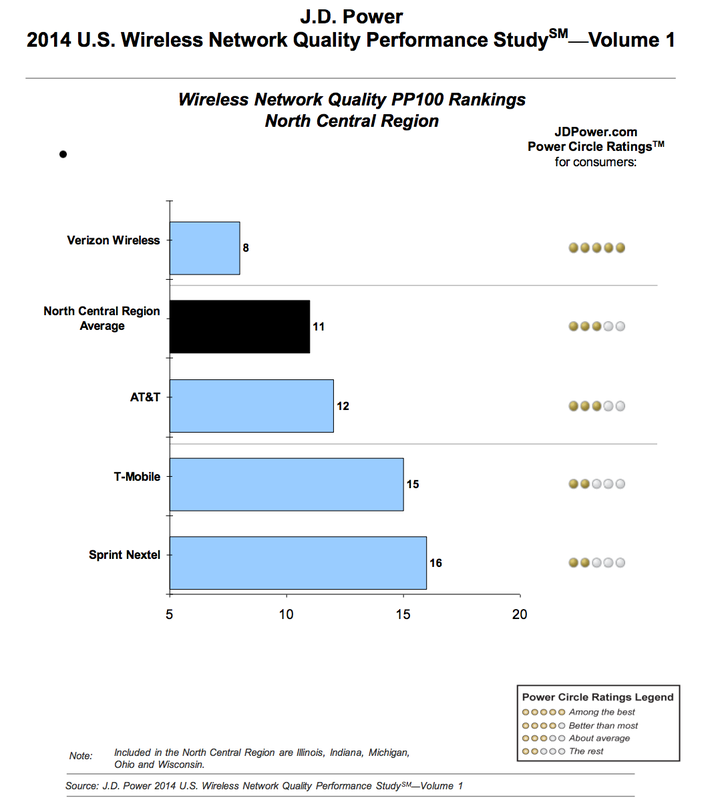 Power wireless carrier ratings for U.S. North Central region. Full report available here. There’s Verizon, there’s AT&T, and then there’s everyone else. If you look at ratings from organizations like Consumer Reports, J.D. Power, etc., you’ll consistently see Verizon and AT&T as the top two carriers for coverage and reliability. That’s been my personal experience as well. Verizon has had a rock-solid network with wide coverage for years — and you pay handsomely for it. AT&T worked hard over the last few years to build out their fourth generation (“4G”) LTE network. Like Verizon’s, AT&T’s LTE network offers much faster speeds than the old 3G networks — 15-20 megabits per second (similar to a home high speed connection) with LTE versus less than 1 megabit per second (Mbps) with Verizon’s 3G technology. AT&T has also made huge strides in terms of reliability — when I first moved to Madison, I gave up on AT&T after numerous dropped calls, delayed text messages and other glitches. Now, the only time I notice problems with AT&T are on Badger football gamedays, when AT&T still struggles to handle the load on its network. In years past, AT&T service has been so bad on gameday that my brother-in-law quipped the only way to communicate with his AT&T iPhone at Camp Randall (or other large football stadiums he visited) would be to set it on fire and make smoke signals. Back then, I would chuckle and refresh ScoreCenter on my Verizon phone. This year, however, I decided I could live with not being able to make calls or send text messages at Camp Randall if it meant saving $25/month per line. But what about US Cellular? I get this question a lot. US Cellular works great here in Madison, or so I’ve heard from everyone I know that has US Cellular. The problem is that they don’t (yet) have 4G roaming agreements with other carriers. That means you can enjoy those blistering fast 4G LTE speeds here in Wisconsin, Iowa, and the scattered few areas elsewhere that US Cellular offers service. But outside of those areas, you will roam on older, slower, and increasingly less-reliable 3G networks. I really struggle to think of a reason to pick US Cellular other than that they are something of a hometown company, having started as a subsidiary of Madison telecom provider TDS. Yes, their network here in Wisconsin is great. But US Cellular has far fewer phone models to pick from than the national carriers, and their pricing is as expensive as AT&T and Verizon, despite offering significantly less coverage. Prepaid plans are a great way to save money, but may not be the answer for you if you need to have the latest and greatest iPhone or other high-end phones like the Samsung Galaxy or HTC One. These phones cost hundreds of dollars off-contract, but are heavily subsidized by AT&T and Verizon when you sign a 2-year contract. Some example math: the new iPhone 6 costs $200 at Verizon with a 2-year contract. Off-contract, the iPhone 6 costs $650. That’s $450 in savings, which more than wipes out any savings you would enjoy with a prepaid smartphone plan. A comparison of Sprint’s network coverage (bottom) versus Sprint prepaid reseller Boost Mobile’s coverage (top). Prepaid plans also often lack the comprehensive coverage that traditional postpaid plans from AT&T and Verizon offer. 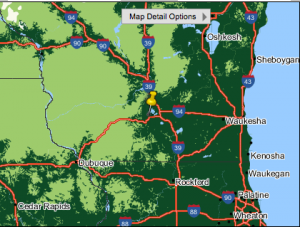 This isn’t an issue in most cities, but if you often travel to rural areas, be sure to check the coverage maps carefully — especially on prepaid plans that use the already small Sprint & T-mobile networks. 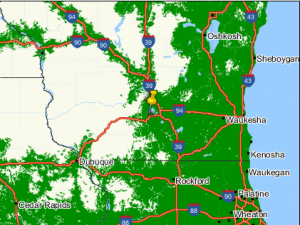 One example: here in Wisconsin large areas in northern Wisconsin (including Door County, and Wausau) have free roaming for Verizon postpaid customers, but not for Verizon’s prepaid customers or those on Page Plus (a prepaid cell phone company that resells Verizon service). Another caveat with prepaid service is that you are on your own for support. With a traditional postpaid contract from a major carrier like AT&T or Verizon, if your phone dies before the warranty is up, you can stop at your carrier’s retail stores and exchange the dead phone for a replacement. With prepaid services like Straight Talk, that’s not an option — you’ll need to sort out your own replacement and will be without a phone until you can get yours repaired or replaced. Sprint has — by far — the cheapest family plan you can get, coming in at less almost a third of the price of comparable plans from AT&T and Verizon. Sprint’s individual smartphone plan offers unlimited data for less than AT&T and Verizon’s 2 gigabyte (GB) plans. T-mobile also has insanely cheap family plans and an attractive $30/month individual plan. The catch: both Sprint and T-mobile fiercely compete on price because their networks aren’t up to par with AT&T and Verizon, providing little coverage outside cities, and spotty coverage within them. I tried T-mobile here in Madison for a few months late last year and ran into so many dead spots (including State Street!) that, for me, the savings just didn’t justify the inconvenience. I’ve heard similar stories about Sprint, which is even further behind T-mobile in rolling out its “4th Generation” (or “4G”) network. If you don’t travel a lot, or you live and work in areas well-covered by Sprint or T-mobile, the savings may be too good to pass up. If you are picking between the two, I’d recommend T-mobile: mainly because if you don’t like T-mobile, chances are your T-mobile phone will be compatible with AT&T’s network. And, as I mentioned, T-mobile is further along in improving its network than Sprint. Unless you are grandfathered in on an older, less-expensive family plan, AT&T and Verizon’s family plans now cost the same (or more) as just setting up individual plans for each phone. The only remaining advantage to these plans is if you have a tablet computer with a cellular modem, you can it to your account for $10/month. 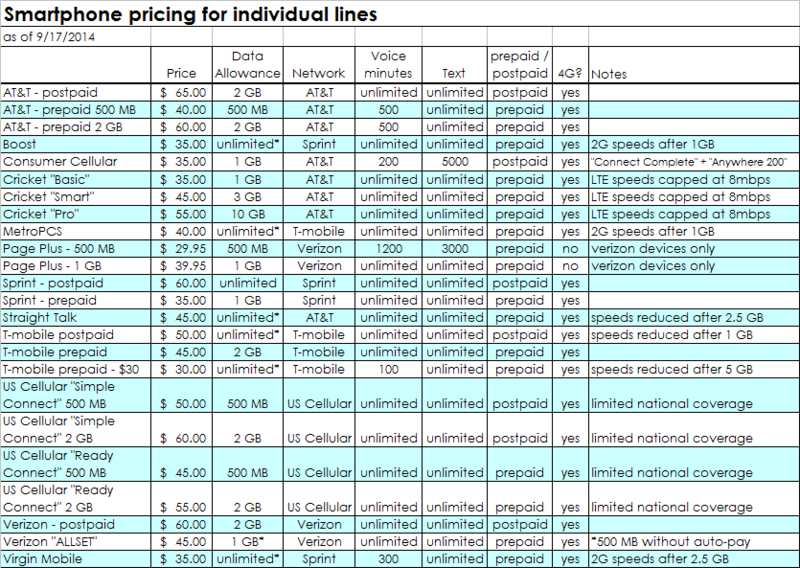 Another word of caution: take AT&T and Verizon’s prices in the spreadsheet above with a grain of salt. Both companies are infamous for adding a number of hidden fees that you won’t know about until you get your first bill. Prepare for sticker shock. On my mother-in-law’s monthly bill from Verizon, she pays $45 for basic cell phone service and over $6/month in various taxes, surcharges and fees. With Straight Talk, my $45 monthly bill results in $3.60 in taxes and fees. One last beef with Verizon is their refusal to allow Google’s Nexus 5 on their network and the paltry selection of new phones that are compatible with Verizon’s prepaid service (most are either used, old, or C, all of the above). The Nexus 5, at “only” $350, is one of the best values you’ll find in a smartphone: high-end specs, with long-term software update support, at about half the cost of a comparable iPhone. It’s available on all of the other national carriers, but Verizon is more interested in keeping folks in 2-year contracts than making affordable phones available to its customers. Along these same lines, Verizon offers Motorola’s Moto G (possibly the best “bargain” smartphone on the market right now) as a prepaid phone. But Verizon only sells the 3G version of the phone, not the newer LTE-compatible version. This limits the download speeds on Verizon’s Moto G to a near-dial-up experience. I’ve used Straight Talk for the last several months, and have been happy with the coverage on AT&T’s network. Getting my phone number ported over to Straight Talk took some work, and configuring the phone to work with Straight Talk was another hoop to jump through. Hopefully you’ll never need Straight Talk’s customer service, which is woefully poor (in other words, slightly worse than AT&T and Verizon’s). Bottom line, for $45/month, it’s a bargain but may not be for everyone. Cricket Wireless, which is now owned by AT&T and resells AT&T service like Straight Talk, is another good option — mobile data speeds are capped at half of what you can get from AT&T or Straight Talk, but if you’re a light data user, the service is another good bargain at $35/month. If network quality is the most important factor for you, and/or you want an expensive phone like the iPhone or Samsung Galaxy, Verizon is probably your best bet, despite their multitude of customer unfriendly policies. I cannot recommend Sprint, T-mobile or US Cellular, but hope that these carriers continue to improve so that we have more credible choices besides the big two.